HCN has a new development associate to help with raising money, planning events and board meetings, and producing a newsletter for former interns. Jason Nicholoff, the eldest son of Circulation Manager Gretchen Nicholoff, grew up in Paonia. After graduating from Ohio’s Oberlin College with an English degree, he did environmental work and grant-writing in Louisiana and Minnesota. Jason also discovered a passion for wine-making and, in 2003, planted 700 grapevines on his parents’ Paonia farm. He moved back here last year with his fiancee, Vannessa Harper-White, and hopes to press his first small batch of white wine this fall. We’re looking forward to tasting the results. Longtime subscribers Jim and Carla Vauthrin, from Colorado Springs, Colo., stopped by in April to say hello. They were in town for the annual Cherry Blossom Walk, a 5-kilometer stroll through local orchards, along with wine tasting and art studio tours. 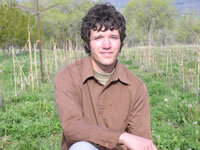 Longtime subscriber Jacob Smith was recently elected to the city council in Golden, Colo. In 1999, he helped found the Center for Native Ecosystems, a conservation group known for standing up for "underdog" species (HCN, 5/26/03: Looking out for the little guys). The Center has championed such rare (and obscure) critters as the Douglas County pocket gopher and the Uinta mountain snail. Smith says he ran for the council because "the conservation community (needs to) persuade our neighbors that we care as deeply about the health of our communities as we do about protecting open space and wildlife habitat." Observant reader Paul Nighswonger wrote to comment that in our April 4th issue, we ran "a picture of calves (young cows) that the caption writer calls ‘cows.’ " Well, he’s right, but can’t we just let bovines be bovines? New York subscriber John Benjamin sent us a note and a clip from the Martha’s Vineyard newspaper Vineyard Gazette, regarding the Cape Wind project that Joshua Zaffos wrote about in the March 7 issue. According to the editorial, "… (T)he Cape Wind backers are proving to be all hat and no cattle. And along the way they have prostituted the good values and sound objectives of the wind energy movement …"
We were saddened to hear of the sudden death of Dennis Machida, longtime executive officer of the California Tahoe Conservancy, on March 4. He passed away after collapsing while giving a talk at the Conference on Mountain Climate and Ecosystems in Pray, Mont. The conference has established the Dennis Machida Memorial Fund to provide scholarships for graduate students seeking to improve communication between climate scientists and policy-makers. For more information, see www.fs.fed.us/psw/mtnclim. We also regret the passing of Shoshone Indian activist Mary Dann, on April 22 on her ranch in central Nevada. She and her sister, Carrie, fought for decades to reclaim millions of acres of Western Shoshone ancestral land, a crusade often covered in HCN. According to The Associated Press, Mary’s niece said her aunt "died as she would have wanted — with her boots on and hay in her pocket." And finally, our recent editorial mascot Torrey, News Editor Jodi Peterson’s Australian Shepherd, went to dog heaven on April 30. We miss you, furface.